Up to 15 companies are considering bids to take over Clyde and Hebrides ferry services from Caledonian MacBrayne, it has emerged. 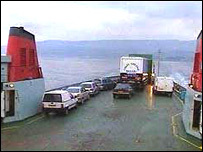 The greatest interest is in the Gourock to Dunoon crossing, CalMac's longest established car ferry. With the ending of the first phase of the tender process, there have been 17 expressions of interest. These cover 10 for the Dunoon service and seven in the parcel of all the remaining 25 routes. Subsidies currently cost the taxpayer about £30m a year, but bidders expect to be asked to provide equivalent or improved services without public support. The identity of bidders is commercially confidential, but it is understood Western Ferries may bid for all the Clyde and Hebrides crossings. CalMac confirmed that it was bidding for both, but said it did not know who its potential rivals were. "The executive haven't told us who the competition is, and we will be concentrating on our bids," a spokesman said. "At this stage we are just steering our own course, as they say." There is also speculation that Glasgow based V Ships and Irish Continental may be interested, along with Red Funnel and the Isle of Man Steam Packet Company. MSPs approved the move to put the state-owned CalMac routes out to tender in September, despite earlier rejecting the idea. Unions and opposition MSPs claimed the process was unnecessary and voiced fears over the impact on jobs and communities. But the executive argued it had no choice under European rules on transport subsidies. Transport Minister Tavish Scott said: "I'm very pleased at the number of companies who have shown an interest. "This is important news for all the communities who rely on our ferry services." Scottish Conservative transport spokesman David Davidson gave a mixed response to the news. He said: "Whilst I welcome the interest shown in these routes, it is difficult to have much faith in the tendering process when the executive is on record as saying it wants CalMac to win. "I would therefore ask the minister to renounce the comments of his predecessor and if he won't, can he tell us how he plans to tilt the process in favour of the state-owned incumbent?" Firms were given until 14 November to respond. Companies will compete for the right to run the subsidised services from 2007. Why is there such a big interest in the ferry routes?